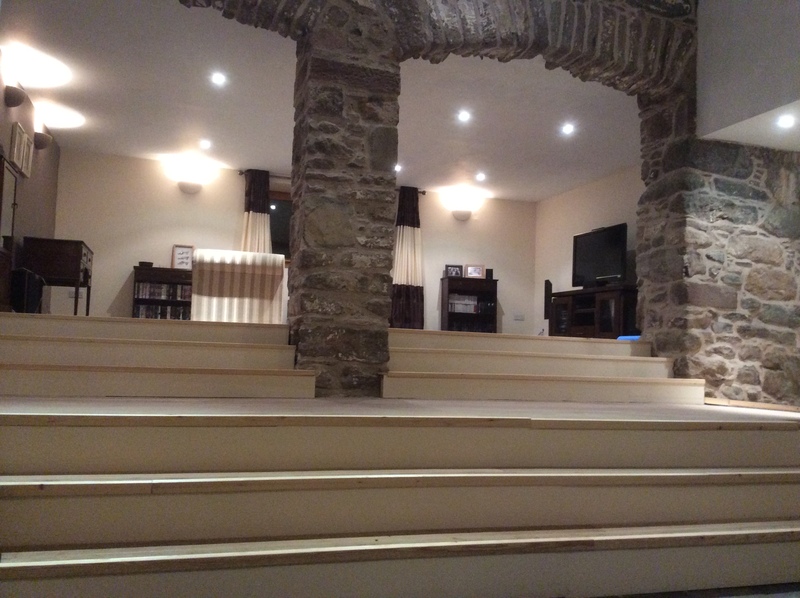 I have been following The Girl in the Hard Hat Shirley Alexander on Twitter for a while now, and reading her blog about an astounding barn renovation that she took on near Blairgowrie about 80 miles north of Edinburgh. I was so impressed with the scale of the project and the fact that she has done the vast majority of the work herself, I really wanted to meet her. She very kindly accepted my request for a rendezvous and we met in a café in London near to where she works as an accountant. I didn’t know Shirley at all, but from the picture on her blog with tool belt and a slight scowl I had an image of a tall and slightly scary Amazonian woman. My image, as it turned out, was completely wrong – in walked a small, pretty, smiling lady – she must have immensely strong core muscles I thought to myself. You bought the barn in 2001, is it finished now? Not quite, I’ve still got to put the main kitchen in. It’s the last thing to be done and then I can declare the build finished. The kitchen floor is probably a job for me to do this weekend. How did you find the barn? I came into housebuilding completely by accident when I came across a Homebuilding & Renovating Magazine at an airport one day, and that was it – I got hooked. There was a feature called the Plotfinder Challenge by David Snell, I sent him a note saying that I’d found a big old mill in Scotland but hadn’t been able to secure it when it went to sealed bids, so was looking for somewhere else to build. He came up to Scotland and we drove around looking for suitable plot. I bought the barn exactly fourteen years and two weeks ago and I’m featured in a Homebuilding & Renovating Magazine article from August 2001. Your barn is pretty much in the middle of nowhere, how far away is your biggest town? The nearest pint of milk, pub and bus stop is five miles away. The nearest town of any decent size is about twelve miles away. I love it up there but quite like it here in the city as well. Is your plan to eventually work less and spend more time in Scotland? Absolutely, or find contract work up in Edinburgh and live there on a permanent basis. I’ve lived in Scotland before and have done a lot of moving around with work, which is part of the reason the build has taken so long. I lived overseas for seven years in Germany and India. When I lived in Germany I would come back to the barn every weekend, sleep in the back of the car and spend all weekend putting the slates on the roof. 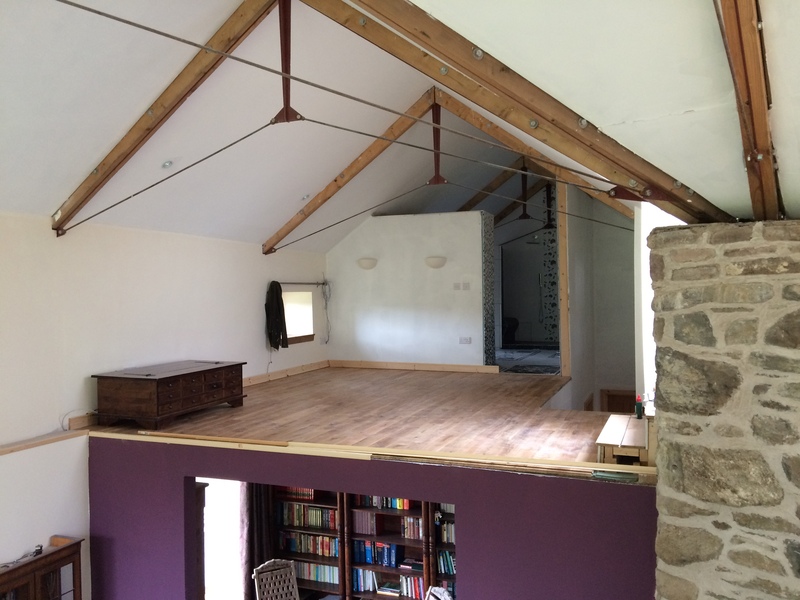 What sort of permission did you need for your renovation? The barn already had planning permission but I wanted to change the design. I reapplied for planning permission which took about eighteen months. I wanted the architect to incorporate a lot of the existing building into the design; I gave him a list of six essential requirements and then let him do what he wanted to do. The drawings he came back with are the ones I’m still using – I haven’t had to change a single thing. How did you find your architect? I found him through my boss at work. Not knowing anyone up in Scotland has been one of the hardest things for me – finding decent contractors has been difficult, which is why I started doing some of the building myself. How many square metres of floor space do you have in your house? About 450 square metres and the ceilings are five metres high. I know that part of the building fell down in the first stage of your project, have you had to do a lot of remedial work? Yes, that was down to an incompetent builder who had no experience of that kind of building. Is it true that you found him in the Yellow Pages? It is true that I contacted half a dozen builders through the Yellow Pages, but the reason I went with him was that he was the only one who spent a bit of time talking to me and going through the plans. He seemed reasonably confident but it turned out that he wasn’t. How did you find your next builder? I didn’t have one after that. He had to repair what he had done and I kept him on to do the roof. 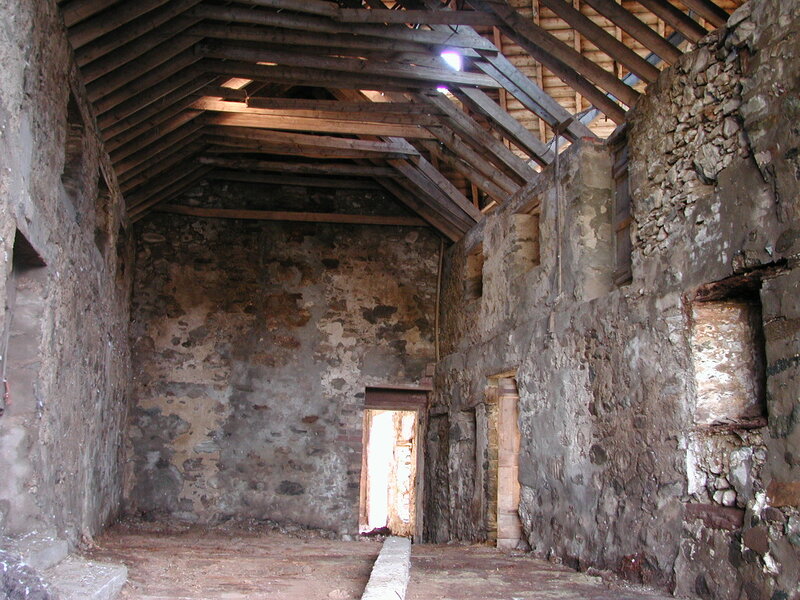 I had the engineer and architect work alongside at the time because it is a particularly complex roof. Have you employed any subcontractors at all? I had a subcontractor for the rough work plumbing and an electrician. About three years ago, when I was doing all the building myself, I had a problem with the roof (a legacy of the incompetent builder). It had leaked on and off for ten years and I just couldn’t get it fixed. Somebody was recommended to me, he gave me a quote and told me it would take ten days, he did it in eight days and the roof hasn’t leaked since. He has been so good and I was bored witless with plasterboarding, so I employed him to help me with it. I still do an enormous amount myself, I’ve got so used to building now; it’s what I do every weekend, but given that I now know and trust him it’s sometimes easier to ask him to do some of the work – I get him to do more structural tasks. How important was it for you to build an energy efficient house? 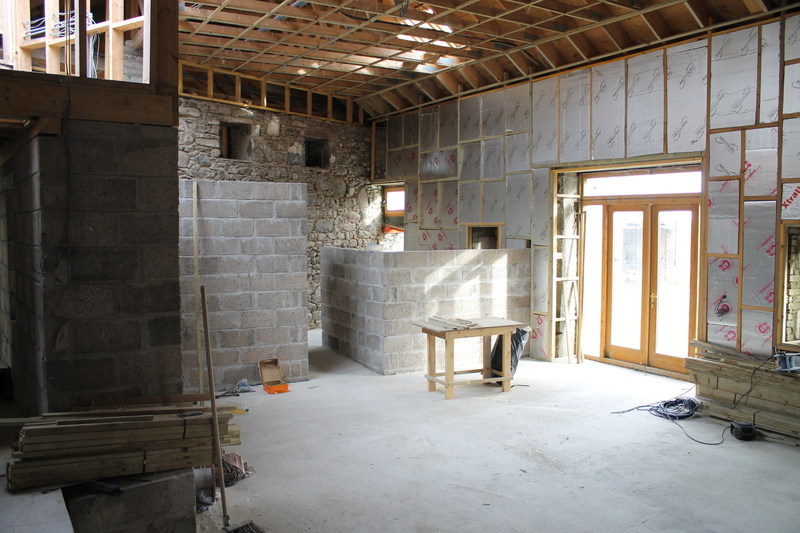 Incorporating energy efficiency in to the building is something that I really wanted to do, but it is difficult when you are working with an existing old stone building which is cold and full of draughts. I have put in a lot of insulation, and as there wasn’t the opportunity to have gas I have a ground source heat pump for the underfloor heating and the hot water. I could have gone for oil but at the time it was very expensive. The only bill I have is for electricity – eventually I would like to have solar power. I also put in a rainwater recycling unit (not that I’m ever going to run out of water in Scotland)! I can’t get mains water either so I had to have a borehole drilled. The installation of the ground source heating had its problems. I find renewable energy companies are very hit and miss and have had a horror story with one of them because of added charges. I was in India when the ground source heating system was put in the barn and by the time I got back, the mice had moved in and chewed it to pieces, so it had to be repaired. I also found out that the company had only installed half the pipework in the ground and had quadrupled their bill. There is a big difference between a quote and an estimate, I may not be a builder but I do understand contract law. They had given me a quote which meant they had to stick to it. It has been a learning experience. The house is nice and warm now. Having spent nights in a frozen caravan there were times when I never feel that sort of warmth again! It can get down to minus 15 – 20 degrees in Scotland in the winter. It is the oldest tattiest caravan in history but after sleeping in the back of a Corsa it felt like heaven. What have been the biggest challenges for you during the renovation? I think it has mainly been the financial pressure. I impulse bought the barn and I didn’t have a clue as to what I was getting into. I was made redundant and it was the toss of a coin that decided whether I would build a house or go travelling around the world. I packed all my things in the back of a mini and travelled up the M1. 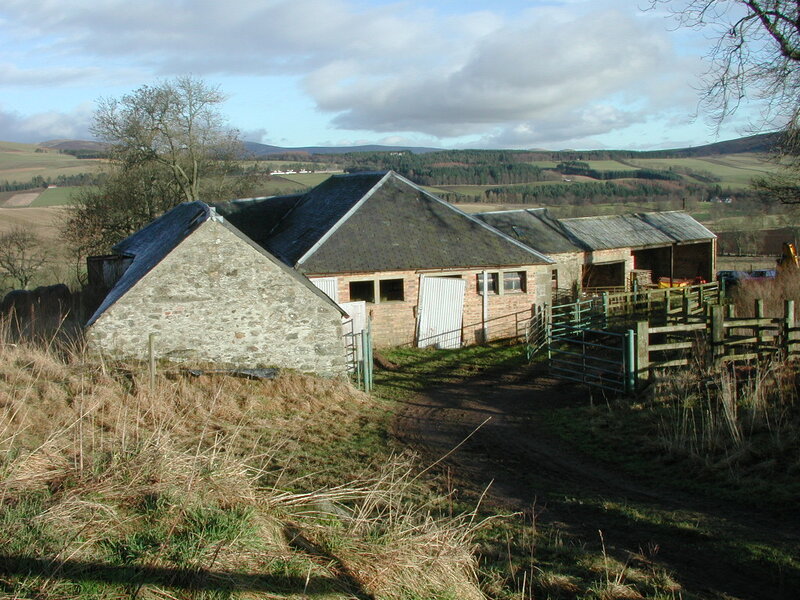 I had no job and no house to stay in – six months later I had a barn in Scotland. There have been times when I have wondered where the money would come from and also moments when I felt like giving up. (The bank of Mum and Dad still comes in very useful). I didn’t take a conventional approach, I had no budget. My architect gave me an estimated build cost and I thought … whatever … it’ll be fine … I can just borrow some money. His estimate was half a million and the actual build cost has turned out to be £300K. Another big challenge was that not being able to be on site all the time to oversee the work, I couldn’t make sure that it was done properly. How have you found being a woman in the world of building? It’s hard to be taken seriously. Where I notice it most is at homebuilding shows in the build trade section. Being a woman on my own the companies will talk to anyone but me, that is until I get my plans out on the table and am able to talk it through – then I get a lot of compliments about having taken on the project. But I have found I was condescended to on occasions. I still go to shows but now it’s more the interiors side of the build I go there for, and as a female I get more attention. There’s still that divide. It’s not just at shows; at the builders’ merchants I don’t think I get as good a deal as a man. What effect has building had on you and the people close to you? For me personally it is the confidence I now have to do anything I put my hand to. My parents have been very supportive; I’ve had them up on the roof doing the tiling! 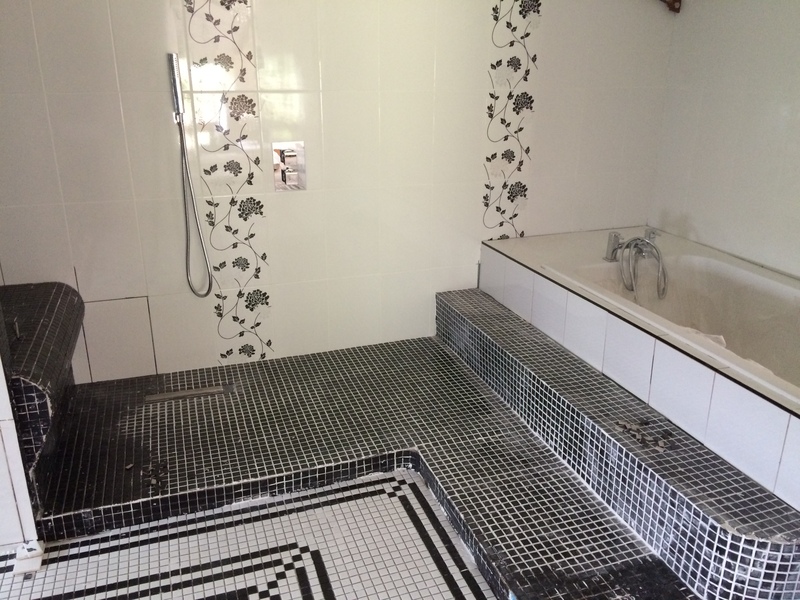 If you have a look at Shirley’s blog, you will see pictures of her beautiful intricately designed bathroom tiling which she made up herself from tiny black and white squares. I asked her how she had managed such a task. The tiling was done in two stages. I made the pattern up in squares at my flat in London in the evenings, and then took them up with me to the barn in my suitcase at the weekend. I made up some of it on an enormous roll which I drove up – it took weeks and weeks. Shirley has even made her own stairs. I am in awe. She says she would like to make the whole kitchen – the spirit is willing but her face says otherwise. Although I can bet you that she’ll make some of it herself. Make sure you plan your finances. I should have been more organised about how much the build would cost me and where the money was going to come from. I didn’t think about it at all and I wish I had. Don’t underestimate how much stress it will put you through. Make sure that the builders you take on can do the job. Take references. If you do find someone good – hang on to them. Sometimes you may have to wait for them if they’re busy, but they will be worth the wait. 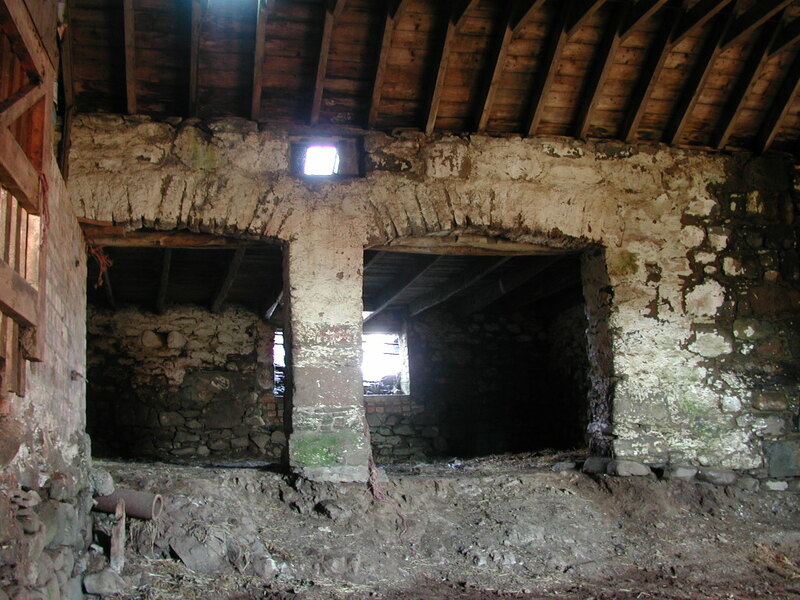 To my mind a lesser mortal would have been terrified if they had bought a crumbling old barn on a whim. It may have taken fourteen years to renovate but Shirley now has a beautiful five bedroom home – one that she would never have been able to afford to buy in London. Having worked in India Shirley was able to commission furniture there and get it shipped to Scotland. It makes me marvel at the delivery, as sometimes we have trouble getting our wood pellets for our boiler delivered to our lane in West Berkshire. She tells me that she’s not quite ready to give up her London life quite yet. She goes to work on a boat up the Thames and flies up to Scotland at the weekends. It’s Friday afternoon and ahead of her she has a one and a half hour flight and then another one and a half hour drive up to her house. If it snows she has to abandon her car and walk five miles up the lane to her house. Thank goodness it’s October and there’s no snow forecast yet. I thank Shirley very much for taking the time to meet me and for sharing the story of her build – most definitely food for thought for anyone thinking of taking on a challenging renovation such as hers. 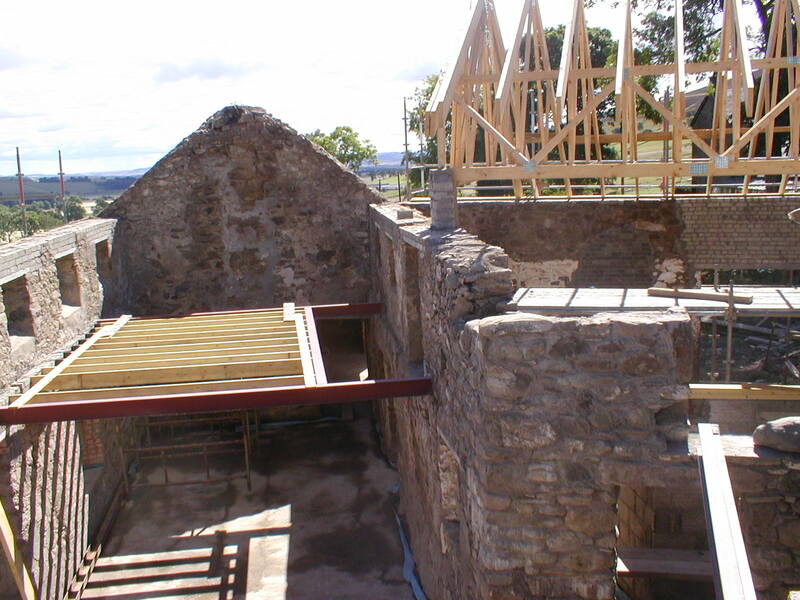 This entry was posted in builders, Building tips, Finding a plot of land, Homebuilding Shows, Interviews, Self-Build, subcontractors, Top tips, Uncategorised and tagged architect, barn renovation, bathrooms, being a woman in building, borehole, Builders, cafe, caravan, commuting, core muscles, Coronation Street, croissants, David Snell, Edinburgh, electrician, Energy efficiency, estimates, furniture, Germany, ground source heating, hard hat, Homebuilding and Renovating magazine, Homebuilding and Renovating show, Homebuilding shows, hot chocolate, India, kitchens, London, money, planning permission, plans, plasterboard, plumbing, quotes, rainwater recycling, renewable energy, roof slates, Scotland, solar power, stairs, subcontractors, tiling, top tips, Top tips for self-builders, Twitter, Yellow Pages on 4th November 2015 by Mandy Clark.